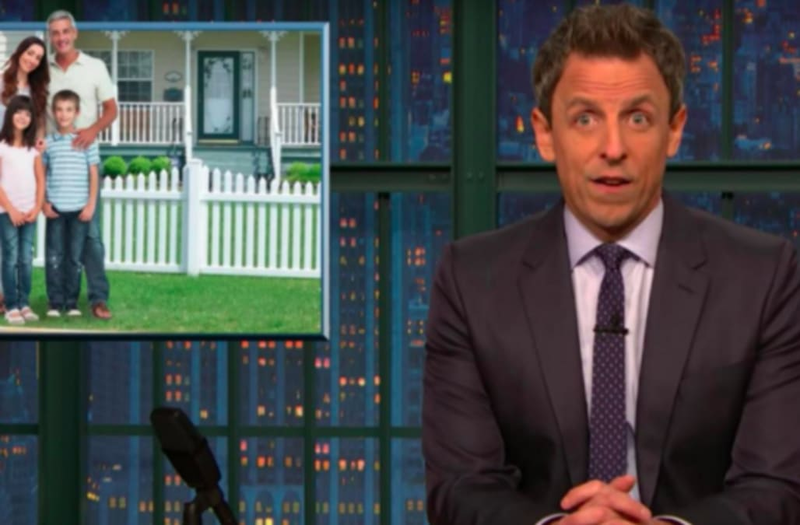 On Wednesday night (Dec. 20), late-night host Seth Meyers attacked the Republican Tax Plan that passed the House and Senate earlier in the day, calling it "a brazen heist of the country." "Republicans passed a sweeping overhaul of the tax code that will overwhelmingly benefit corporations and the wealthy, amounting to nothing less than a brazen heist of the country," Meyers said, introducing his "Closer Look" segment on NBC's Late Night With Seth Meyers. Meyers mocked President Donald Trump's repeated references to the bill as a "Christmas present" to the middle class, which, in at least one appearance, he has linked to prior promises to bring the phrase "'Merry Christmas' back." Noting that TV shows often air Christmas episodes, seasonal commercials feature Christmas songs and that Meyers' office overlooks Rockefeller Center's 70-foot Christmas tree, the host quipped, "If you want to bring something back, try Kwanzaa — that thing straight-up disappeared." Actor Seth Myers attends Fashion's Night Out: The Show at Lincoln Center on September 7, 2010 in New York City. Meyers also pointed to a recent Forbes article reporting on a Tax Policy Center report arguing that by 2027, over 80 percent of the plan's benefits would go to the top one percent of Americans, while 53 percent of taxpayers would see a tax hike. Next year, the same Forbes piece reported, middle-income households would get an average tax cut of $900, while higher-income households would pay about $50,000 less in taxes. "So to recap: If you're rich, you're getting a car for Christmas. If you're not, go ahead and wrap up a can of gas," Meyers said. Speculating on how Trump himself would benefit from the tax bill, Meyers argued that the recently lowered bracket for top income would benefit the president, as would tax breaks for "pass-through businesses" like the Trump Organization and the bill's provision that allows the pass-through tax break to apply to real estate investors. When envisioning the "average family" that Republican politicians have claimed would benefit from the bill, Meyers said, "Yeah, you know, that average American family that has two kids, a house, a white picket fence, corporate income, non-corporate business income, three limited-liability corporations, two S corporations, two C corporations, a commercial real estate venture, a limited liability partnership, carried interest, oh, and a dog."